Car-sharing is an all-around great deal for cities. According to research from UC Berkeley [PDF], each shared car removes 14 from the road. It cuts down on carbon emissions [PDF]. Car-sharing users even spend more at local businesses [PDF]. You would think cities would be bending over backward to welcome these communal vehicles. 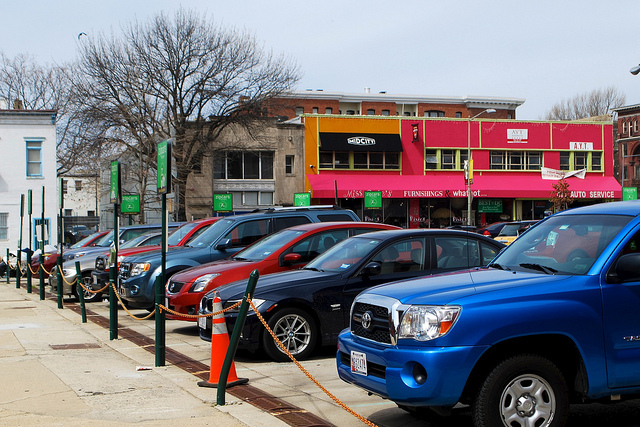 But Washington, D.C. has imposed a steep parking fee on the city’s car sharing fleet. At $200 to $400 per month, the cost will add about $1 to $2 to the price of using a car. DDOT, rather than levy a 20 percent tax on carsharing members whose behavior benefits the neighborhood, should keep carsharing affordable and instead tax private car use – the main source of congestion and many environmental problems. DDOT could raise the same revenue with a painless $2 annual fee for all residential parking tags. Or it could simply charge $100 annually for each household’s second car. Or implement smart meters, which vary prices based on real-time demand, ensuring that around 15 percent of commercial on-street parking spaces remain available. In downtown Redwood City, Calif., smart meters generate $1 million of additional revenue each year for safer, cleaner sidewalks. The worst part is that car owners will continue to park on-street virtually for free. Annual tags will still cost $15 per household, with the second car parking totally free. Why should carsharing members pay market rates for on-street parking, while car owners get a subsidy? It’s totally backward policy. Donald Shoup, in his seminal book, “The High Cost of Free Parking,” estimates the market value of on-street spaces in central Los Angeles at $31,000 each – more valuable than the vehicles parked in them. Subsidizing car ownership with free parking distorts the market, encouraging more people to own and drive cars. As Shoup says, everyone pays for free parking – except the driver. Now in D.C., sadly, even carsharing members will. Elsewhere on the Network today: Mobilizing the Region reports that Nassau County has a $26 million surplus, just enough to keep afloat the Long Island Bus service it claims it can’t afford. The Atlanta Bicycle Coalition brings word that locals have taken up “tactical urbanism” to demonstrate the need for more public space. And Grid Chicago says that new bike lanes just keep appearing in the Windy City.